Codes for Western Digital Media Player. If you have lost your remote control or looking for a better remote, here is a list of remote controls that will be compatible with your WD TV Media Player. 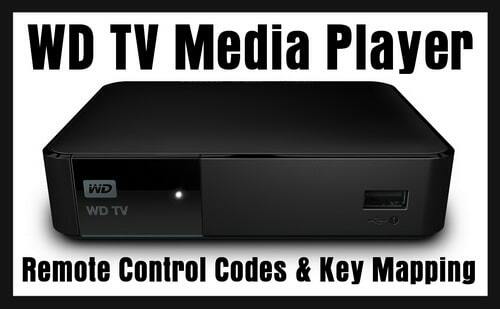 We also list the remote code that will work with the WD TV Live Media Player. These universal remote controls are compatible out of the box with the Western Digital HD Media Player. You must use the setup code 2558 for video accessories. The above ONE FOR ALL Remote Controls URC can be found here…. These remotes will work after the phone upgrade or online download of the setup code 2558 for video accessories. You may need to map some keys on the remote to get all buttons correct with the “One For All” type or brand of remote controls. Have questions about programming a remote to work with the WD TV Media Player? Please leave a comment below and we will assist you. I have an Audiosonic kgr6 remote and have no manual, any ideas on how to program and codes? Can you help programming a Bose Cinemate GS 2 remote control to operate my WD TV Live? Please check the Full BOSE CINEMATE SERIES II – CINEMATE GS SERIES II Owner’s Manual for more details.